The R&A today unveiled a new Women in Golf Charter as part of the organisation’s drive to increase the number of women and girls participating in golf and to encourage more opportunities for women to work within the golf industry. The Women in Golf Charter aims to inspire an industry-wide commitment to developing a more inclusive culture within golf around the world and to enable more women and girls to flourish and maximise their potential at all levels of the sport. Adoption of the Charter will also require national federations and other golf bodies to build on current initiatives and develop new projects that will focus on encouraging more women and girls to play golf and stay within the sport as members of clubs, while also empowering women to enjoy successful careers working within the golf industry. 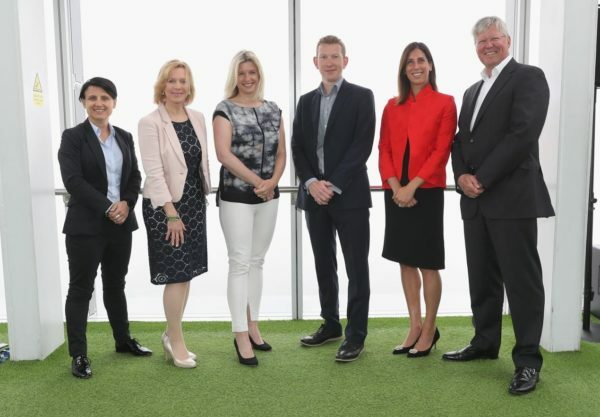 Martin Slumbers, Chief Executive of The R&A, outlined its plans to work in collaboration with its affiliated organisations, partners and the wider golf industry to achieve these goals at a launch event at The View from The Shard, one of London’s most iconic venues. Hosted by renowned sports broadcaster Hazel Irvine, the event also featured presentations and panel discussions with guest speakers including Nick Pink, Chief Executive of England Golf, Sky Sports’ Golf Presenter Sarah Stirk, Chyloe Kurdas, National Female Participation Manager at Golf Australia, and Liz Dimmock, Founder of Moving Ahead. The event was attended by representatives of golf organisations worldwide who have pledged their support as signatories of the Charter, including the European Tour, the Ladies’ European Tour, the European Golf Association, the Professional Golfers’ Association, the European Disability Golf Association, Golf Australia, Golf Canada, the Golfing Union of Ireland, England Golf, the Irish Ladies Golf Union and Scottish Golf. Martin Slumbers, Chief Executive of The R&A, said, “We are asking the golf industry to recognise the real importance of increasing the number of women and girls playing golf and empowering more women to enjoy successful careers at all levels of the sport. “The Charter is a strong statement of intent from the golf industry that it has to change and a commitment on behalf of all of us to take measures designed to achieve positive change for women, girls and families. This is crucial to growing participation in the sport in the years ahead. “We ask our affiliates and partners around the world to pledge their support and commitment to achieving this vision and to help us ensure that we have a thriving sport in 50 years’ time that our children, grandchildren and great-grandchildren can enjoy. Tracey Crouch MP, Minister for Sport and Civil Society, said, “We are committed to creating an environment where women and girls can succeed at every level of sport. Liz Dimmock, Founder of Moving Ahead, said, “The case for a more balanced and inclusive culture for golf is clear and a real cultural shift is required within the sport to create a more equitable participation base that reflects the demands of current and future generations. The Women in Golf Charter is another positive development for the sport following The R&A’s successful merger with the Ladies’ Golf Union last year. In 2018, the organisation also launched the Women’s Amateur Asia-Pacific Championship which was staged at Sentosa, Singapore in February while the new Girls Under 16 Open Championship was played at Fulford, York last month. The R&A also provided an initial three-year funding package of £375,000 to its affiliates in Australia, England, Ireland, Scotland and Wales to support the appointment of new development managers to work on increasing participation by women and girls. Pictured on the putting green at Bush Hill Park Golf Club are (L-R) Graham Careford (Head Greenkeeper), Ashley Proctor (Irrigation and Water), Victor Jamieson (Irritech), Stewart Judd (General Manager) and David Dickinson (Club Captain). Bush Hill Park Golf Club is a stone’s throw from Enfield Town in North London. Originally 9 holes, this 100-acre parkland course was designed by Open Championship winners James Braid and Harry Vardon and enjoys a reputation for being the best maintained in the area. To help build the case for investment in a new irrigation system, Graham began keeping a detailed timeline, recording all system faults, breakdowns and overtime as well as taking photographs of course conditions. This information was presented to the management committee to inform decision-making and help the club properly evaluate its various options. The club appointed Irritech Limited to undertake the irrigation system design and specification and to coordinate a competitive tender process for a fixed price contract including warranties and retentions. The committee decided that the major investment of £300k in a new Rain Bird IC™ Stratus™ II Central Control System with Windows™ 10 functionality and mapping for greens, approaches and tees would provide the system reliability and future water efficiencies that would maintain the quality of the course for many years to come. With over 300 sprinkler heads, 7 miles of piping, 6.5 miles of cable and 3,500-man hours, the contractor, Irrigation & Water brought the project in within budget. The new system will be operational this spring. Mannheim, 9th May 2018 – John Deere, one of the world’s leading golf course equipment suppliers, is confirmed as the latest big-name partner to commit to The Solheim Cup at Gleneagles from 9th-15th September 2019. John Deere will be the Official Golf Course and Turf Maintenance Machinery Event Partner at Gleneagles for the 16th edition of the biennial match. The John Deere brand has a long association with professional golf having been a title sponsor on the PGA Tour, Official Supplier to the PGA Tour for 25 years, Official Supplier to the Ladies European Tour and a partner at numerous Solheim Cup events. In addition, John Deere is also the partner of choice for Gleneagles, where the company exclusively provides golf course maintenance machinery and equipment for use across all three golf courses. John Deere’s partnership at The 2019 Solheim Cup will include on course branding, a display of John Deere products in the Spectator Village and utilising the association and event collateral for customer promotions and incentives at dealerships worldwide. The recently appointed European Captain and VisitScotland Ambassador, Catriona Matthew, will be looking to return the trophy to Europe in 2019 after an inspired USA team retained the trophy by 16½ to 11½ points, in front of record crowds in Iowa. Organisers are now aiming to set a new record for a European edition in 2019. Themes of equality, innovation and experience will be threaded through all the event’s communications as The 2019 Solheim Cup aims to engage both the traditional golf audience and the wider sport fan, raising the profile of women’s golf both in Scotland and internationally. The Scottish Government and VisitScotland have been long-time supporters of the women’s game, having partnered with the Ricoh Women’s British Open and the recently significantly enhanced Aberdeen Standard Investments Ladies Scottish Open, which took place as a co-sanctioned LET and LPGA event for the first time last year. The 2019 Solheim Cup will not only showcase the stunning assets of Scotland, the Home of Golf, but also build on the legacy of the successful 2014 Ryder Cup at Gleneagles. It will underline that Scotland is the perfect stage for major golf events as it seeks to help inspire a new generation of children to take up the game invented in their home country. This summer the Turf Team at Le Golf National, near Paris, have the unprecedented challenge of preparing first as the home for the prestigious French Open, and then, just three months later, to be ready to host The Ryder Cup 2018 – the World’s biggest golfing event,. It will give a fascinating insight into the practices, the preparations and, above all, the people who are committed to the success of both events. Updated throughout the weeks and days leading up to the events, it will catalogue the events through a series of exciting video diaries, personal blogs and articles, covering just what goes into ensuring the condition, performance and recovery of the awesome Albatros course. The existing Le Golf National Turf Team of 40, headed by Golf Courses and Estates Manager, Alejandro Reyes and Albatros Superintendent, Lucas Pierre, will swell to a total of 80 for the French Open, with the help of greenkeepers from across France. And then it mushrooms to huge Turf Team of an incredible 180 people for The Ryder Cup – coordinating an International greenkeeping effort from across the globe. The TurfTeamChallenge website and #turfteamchallenge twitter account will be your portal to hear about what’s going on and to learn from the experiences of everyone involved. Alejandro Reyes said: “The excitement is already building. You can feel the anticipation in the air. Everyone involved is aware that the eyes of the world are on Le Golf National. On the TurfTeamChallenge website you can get to know the people behind the event. Alejandro and the team have already started posting information on some of their preparations. Other greenkeepers from the UK, Europe and the US who are heading for Paris in October explain why they are doing it, and what they aim to achieve. You can even ask Alejandro and his team up to the minute questions at #askalejandro and get involved in the conversations yourself. Sharing your tips and thoughts might just make the difference in preparing a course to bring the Cup back to Europe. The Albatros course at Le Golf National is the permanent home of the French Open, being held this year from 28 June to 1 July. In 2011, the course was named as the European host for The Ryder Cup 2018, to be held on 28–30 September – although the course’s turf team will have been preparing for months and the International greenkeeping team – sponsored by Syngenta – on-site for at least a week prior to the first tee-off. Follow their progress, learn from their experiences and share in the excitement and anticipation of these incredible events in France this year.